Winemaking is increasingly popular in Nova Scotia. Winemaking works well here in Nova Scotia, although you wouldn’t know it from our northerly position on the map. 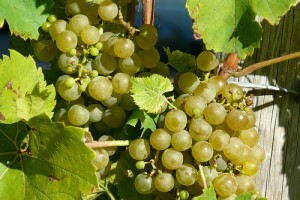 With the Atlantic Ocean helping to moderate the climate, grapes have been grown for wine here as far back as the 1600s. Today, Nova Scotia’s wine industry is turning out many fantastic wines to please your palate. There are no less than nine different vineyards across the province, from the South Shore and Annapolis Valley to the Malagash Peninsula along the northern coastline and the island of Cape Breton. The most famous of these is Jost Vineyards and you can visit anytime for a free tasting and walk through the fields. Grand-Pré, near Wolfville, is another popular spot to try local vintages. Grapes ripen into October, slowly increasing their flavour and setting the stage for the production of our famous sweet ice wine – made from grapes picked while still frozen and pressed while temperatures hover below 8°C. White wines are made from varietals including L’Acadie Blanc, perfect with scallops, the exotic and full-bodied New York Muscat, the crisp Seyval Blanc, lemony Vidal Blanc and the classic Chardonnay. Red wines focus on the rich and smoky Baco Noir, the often peppery Leon Millot, full-bodied reds made from Marechal Foch, the fruity Luci Kuhlmann and Pinot Noir, a light red perfect with salmon.